Taking chess streaming to a whole new level! Chess is becoming increasingly popular on streaming sites like Twitch and Youtube. 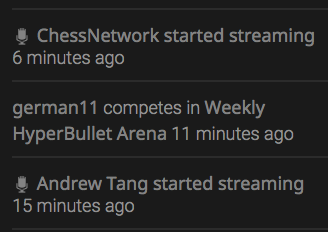 To help enrich the streaming and chess world, we built some new tools to facilitate both streaming and watching streams. 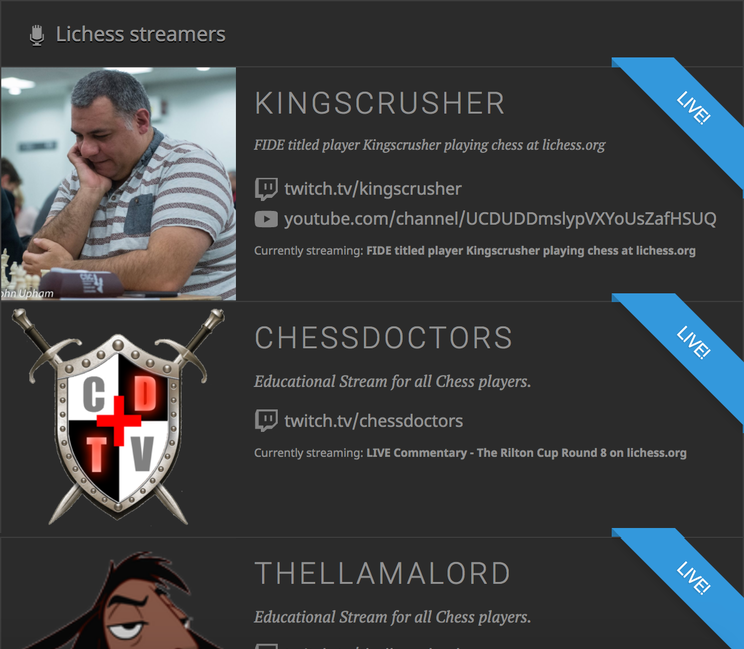 We're happy to announce the Lichess Streamer Community! Streamers get new tools to reach out to their viewers, and viewers will find it easier to discover interesting streamers. By becoming a lichess streamer, you get your own streamer profile, with your stream embedded. Check out Andrew Tang's profile for an example. All streamer profiles are listed on our new streamers list, live streamers on top, and the rest sorted by the time they were last seen on lichess. Access the streamers list from the "WATCH" dropdown menu. Their stream is just one click away! Selected streamers are featured on the frontpage, like before. To join the Lichess Streamer Community, just go to lichess.org/streamer/edit and create your profile. When your profile is approved by moderators, it will appear on the streamers list! 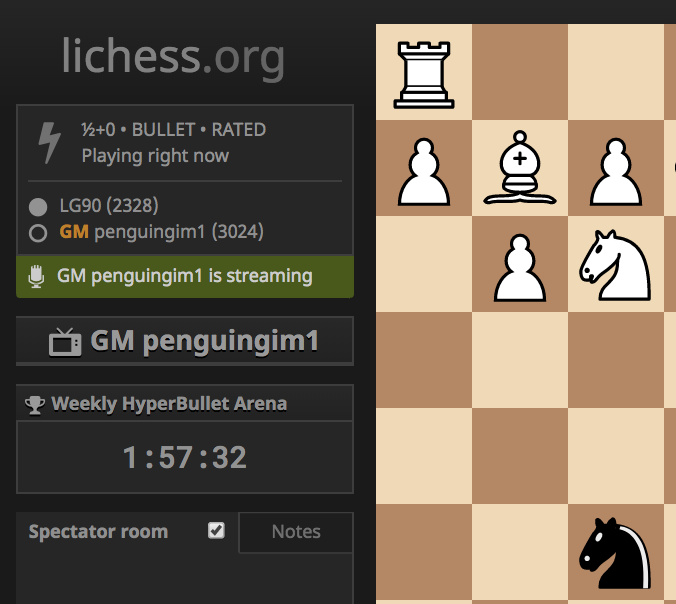 When you go online, it will appear live whenever lichess.org is part of your stream title. If it meets the requirements for frontpage featuring, your stream will also appear on the lichess frontpage. 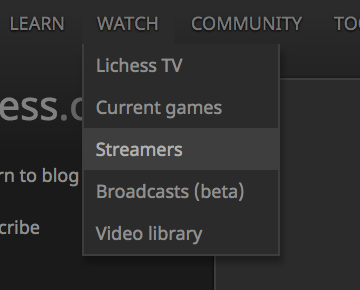 Being a part of the Lichess Streamer Community, you are of course free to stream other games and on other chess servers, just remove lichess.org from your stream's title when you're not streaming on lichess. We recently created an official Lichess Twitch account, where we will cover events like the Titled Arena. We plan to host shows with prominent streamers and chess players on that account in the near future. 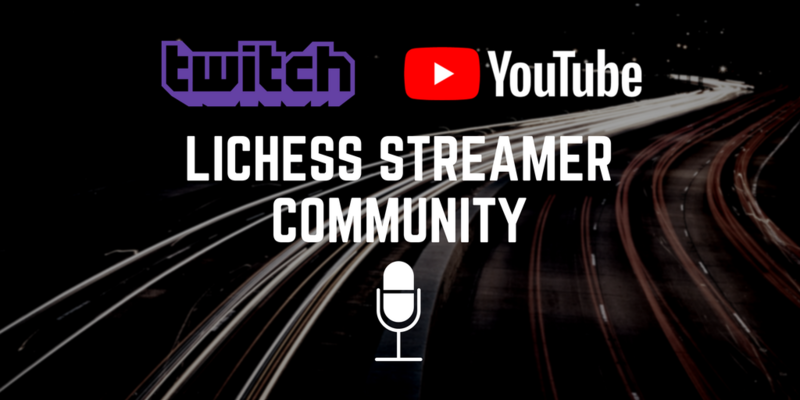 We'll also host streamers from the Lichess Streamer Community on the official Twitch account. Haven't streamed before, but want to start? Do you want to stream on lichess, but don't know where to start? Create an account on Twitch. Then you need a broadcasting software. We suggest OBS (Open Broadcaster Software). This tutorial shows you everything you need to know to get your first stream up on Twitch! Update: In April 2018, we published this streamer's kit that includes a nice overlay and some graphics and fonts that you can use on your stream!